BOTD, Are you playing options on ISRG, GOOG earnings? Where do you see GOOG tomorrow? nope, nope. REW the day! not getting a sense of any directions right now...BOTD what's your take on direction right now? the trend is lower , but kinda stuck at 8,500... not much to do. can we get a mini rally now? CBG?? i know crazy right!! but the market cap is 1.2B..they just bought trammell crow for 2B..any thoughts here? value? 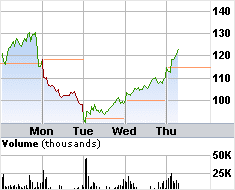 i did not trust it ..
intraday 10% swings all over the place. UYM , taking 1/2 off at the buzzer. Loaded some HK @10, thanks :), any price target ?? hated the MOS play... never buying anything that I do not understand. are you still in MOS? which strike? if its just a trade for you , take profits soon.